It’s another busy weekend for world politics — especially with regard to municipal elections in two G-8 countries. Here’s a quick weekend update of the three world elections taking place today and tomorrow. First, the Maldives on Saturday elected all 77 members of the Majlis, the unicameral Maldivian parliament. The parliamentary elections follow the highly botched presidential election last autumn — the initial September vote was annulled and Maldivian election officials postponed the vote to the point of constitutional crisis. By the time the country held a new vote in November, it pushed through a runoff just five days later. Former president Mohammed Nasheed, who won the first round, lost the runoff to Abdulla Yameen, the half-brother of Maumoon Abdul Gayoom, who previously governed the Maldives between 1978 and 2008. The polls are already closed there, and the voting has gone smoothly, according to initial reports. Results are expected on Sunday, and the contest pits Nasheed’s Maldivian Democratic Party against Gayoom’s Progressive Party of Maldives. In Japan, Osaka’s controversial mayor Tōru Hashimoto (橋下徹) is forcing a mayoral election after resigning in February in what amounts to a power play over his plan to unite the city of Osaka and Osaka prefecture into a larger ‘Osaka-to’ region. Though no major party is running a candidate against Hashimoto (pictured above), the popularity of the former television personality has fallen rapidly both at the national and local level. His bid to join forces with former Tokyo mayor Shintaro Ishihara to form the right-wing Japan Restoration Party (日本維新の会, Nippon Ishin no Kai) made waves in December 2012 when it nearly became the second-largest force in the lower house of the Japanese Diet, but Hashimoto’s rising star has faded over the past 15 months, not least of all because of his insensitive comments that attempted to justify the use of ‘comfort women’ — Korean sexual slaves — by Japanese soldiers during World War II. 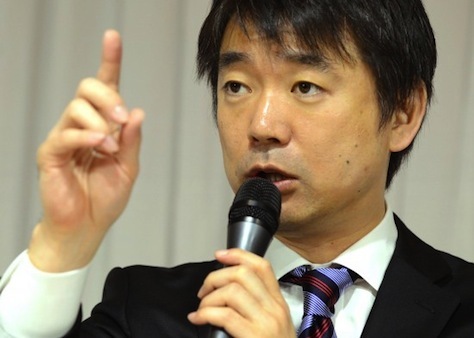 Though Hashimoto will likely win reelection in the Osaka vote on Sunday, his critics have attacked the election as an unnecessary waste of taxpayer money. Hashimoto, who served as the governor of Osaka prefecture between 2008 and 2011, has served as the city of Osaka’s mayor since 2011. In 2010, he founded the Osaka Restoration Association (大阪維新の会, Ōsaka Ishin no Kai) under the banner of ‘One Osaka,’ his longtime campaign to unite the prefecture and the city as one larger metropolis, like the structure of Tokyo’s combined metropolitan government. Osaka is Japan’s second-most populous metropolitan area, and Osaka prefecture, which encompasses the city of Osaka, is home to 8.9 million residents. The plan faces opposition by the Osaka city council, where Hashimoto’s Osaka Restoration Association doesn’t hold a majority. Though there might be gains in merging the prefecture and city governments, critics fear that Hashimoto is more motivated by the possibility of creating a regional political empire. The central government also opposes the plan, because it might mean ceding power from the federal to the prefectural level. French municipal elections are also taking place this weekend — the first round will take place Sunday, with second rounds to follow next Sunday, March 30. The indisputable highlight of the French elections is the Paris mayoral race, with Bertrand Delanoë stepping down after 13 years in the office. The race will almost certainly result in a runoff next week between first deputy mayor Anne Hidalgo, the Andalusia-born candidate of the Parti socialiste (PS, Socialist Party), and Nathalie Kosciusko-Morizet, a moderate who served as a former minister of ecology, sustainable development, transport and housing and as campaign spokesperson for Nicolas Sarkozy in 2012. The vote takes place amid one of the worst bouts of air pollution that Paris has seen in recent years, which caused the city government to impose emergency restrictions on automobiles last week. Though polls forecast a tight race, Hidalgo has held a consistent, if narrow, lead over Kosciusko-Morizet for nearly a year — the most recent BVA poll from mid-March predicted that Hidalgo would win the second round by a margin of 53% to 47%. Outside Paris, however, the elections are a test for the struggling administration of France’s socialist president François Hollande, and an opportnity for France’s far-right Front national (FN, National Front), with its leader Marine Le Pen hoping to win at least some mid-sized towns and villages in the FN’s traditional stronghold in the Mediterranean south and in the economically depressed post-industrial north.